Liberia’s premier airport, the Roberts International Airport is not only experiencing major facelifts on its runway and terminals, but is at the same time attracting investments that are geared towards opening up the country for more investment, especially in realization of the Economic Community of West African States (ECOWAS) regional economic integration—And it is in this vein that the Ghanaian carrier, Africa World Airlines (AWA), has become the latest carrier within the region to begin flight to and from Monrovia. AWA, which is Ghana’s largest and that country’s fastest-growing regional carrier, is poised to begin its maiden flight to Liberia shortly, joining a host of other carriers that are making use of the RIA facilities and at the same time making Liberia their home. 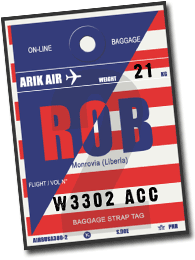 As the latest carrier to add to the collection in Liberia, AWA will operate a thrice-weekly service between Accra and Monrovia, beginning Tuesday, December 12. The start of a direct service by Africa World Airlines (AWA) between Ghana’s capital Accra and Monrovia is expected to deepen trade relations between the two countries, the Airline’s local Head of Commercial, Richard Kyereh told a forum of Liberia Travel agencies in Monrovia on Friday. During a power-point presentation at the acquaintance gathering, Mr. Kyereh disclosed that the airline will operate flights on Tuesdays, Fridays and Sundays, a new service that will offer the traveling public more options traveling between the two West African states. Accra-Monrovia-Accra flights will depart Kotoka International Airport at 11:30 a.m. on Tuesdays, Fridays and Saturdays and arrive in Monrovia at 1:30 p.m. The return flight will depart Monrovia at 2:10 p.m. and arrive in Accra at 4:10 p.m., he said. The airline is in partnership with Hainan Airline, one of the largest Chinese airlines. It has six carriers and will use an E-145, a 50 seater aircraft, on this route. Mr. Kyereh also disclosed that the company will shortly acquire additional two E-190 (90 seater) aircrafts, to add to its Monrovia fleet. The airline will also shortly begin commercial flights to Abidjan, Dakar, Freetown and Banjul, he disclosed. Apart from Ghana, where the airline is said to be dominating the industry, it currently flies only to Lagos five times weekly. In terms of safety, Kyereh he said AWA is a member of the International Air Transport Association (IATA). An airline can only be a member when it is IATA Operational Safety Audit (IOSA) IOSA certified. IATA supports aviation with global standards for airline safety, security, efficiency and sustainability while IOSA is the benchmark for global safety management in airlines. The vision of a more economically integrated West Africa is gradually becoming a reality as more regional airlines begin intra flight services in the region. It could be recalled last December, Med-View Airline, a private Nigerian aviation firm, launched its maiden flight from Lagos, Nigeria, to the Roberts International Airport (RIA), Liberia. Med-View Airline has since operated a regular flight to Accra, Ghana, Monrovia, Liberia, and Freetown, Sierra Leone, respectively. The Med-View management, at a program held at the RIA upon the arrival of the maiden flight, said the historic arrival of its maiden flight Number VL0203 was part of its efforts to support the shared vision of free movement of trade and services within the ECOWAS region. Ghana and Liberia have very good diplomatic relations and it is no secret that a significant number of nationals of both counties (Liberians and Ghanaians) current live and work in across the two countries. Another point to note is that fishing communities along Ghana’s coasts have relations in coastal Monrovia as well. AWA Sales and Marketing Manager, Victoria Abena Takyi, at the forum underscored the impressive strides AWA has made in its four year of existence and their quest for growth and their ever expansion in the region, has led them to the Liberian market. She made mention of the quality of services that AWA brings to the aviation industry in Liberia. “Quality is a habit and not an act and so at AWA we have always provided quality services,” she said. She said the company is here to stay, but that is also incumbent upon the reception from the Liberia people. “We are here to stay but that is if you want us to stay,” she said. She indicated that the Airline is the best in Ghana and its high quality performance is reflected in the number of awards it has won. AWA, she noted, has won Ghanaian Best Domestic Airline of the year on six consecutive occasions, while the airline also won the Africa Best Brand of the year in 2016. In remarks, a member of the Liberia Travel Agencies, P. Cammue Kollie, lauded AWA for coming to invest in the Liberia aviation industry. “We are ready to work with you and will ensure that you stay,” he said. Meanwhile, the officials said that any customer who flies four times with AWA is guaranteed a free ticket on his/her next flight and anyone, company or group that purchases ten tickets for AWA’s flight automatically get one ticket free.